You can use AFerry to book an Agoudimos Lines ferry to Italy, Greece and Albania. Agoudimos Lines is a traditional Greek maritime corporation, with thirty years and unrivalled customer service. AFerry always has cheap prices for Agoudimos Lines ferries and the latest special offers. You can use AFerry to book Agoudimos Lines ferries to Igoumenitsa, Corfu, Andros, Tinos, Mykonos, Rafina and many more! For all Agoudimos Lines routes and the latest prices and sailing times see below. Click on your ferry route for a detailed Igoumenitsa Ferries timetable. 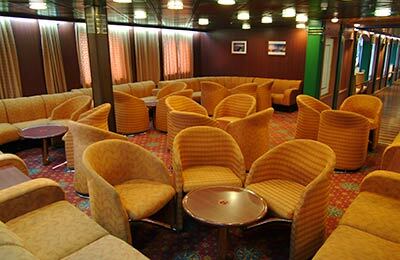 On board one of Agoudimos Lines modern air conditioned ships you will find a full range of facilities. You will find shops, indoor and outdoor bars, a disco, casino, WI-FI internet access and special children's play areas. In the warmer months you might consider taking a dip in the ferry's swimming pool on deck! 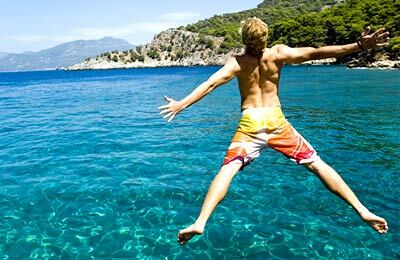 You holiday will really begin the moment you step on board. 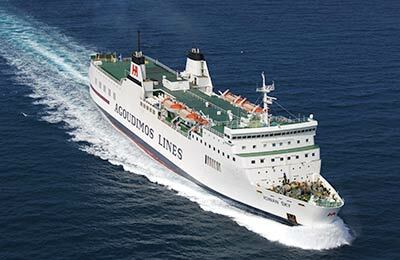 Whether you use the Agoudimos Lines Andros Mykonos ferry route, the Agoudimos Lines Brindisi Corfu ferry service, the Agoudimos Lines Tinos Mykonos ferry, or any other Agoudimos Lines ferry, you are bound to have a relaxing and enjoyable journey. How long before departure should I arrive for Agoudimos Lines? Check-in is 2 hour prior to sailing departure for all passengers.